Body Attack Low Carb Bread is an easy in preparation bakery mix for making a bread of high protein content and low carbohydrates content. One bread slice (35 g) contains 11.8 g of protein and only 2.5 g of carbohydrates. Low-carbohydrate diets are the most effective and the most popular strategy used by people trying to loss their weight. Your reason for taking up a diet does not matter. Health, good look, sport results? In all of these cases a low-energy diet poor in carbohydrates will be the best choice. Everybody having a low-carbohydrate diet will give up on bread, rise, pasta and potatoes as these products are rich in carbohydrates. Traditional bread usually contains 35‒40 g of carbohydrates in 100 g of the product. The ready bread Body Attack Low Carb Bread contains only 7 g of carbohydrates in 100 g of the product. Imagine being on a low-carbohydrate diet and eating a sandwich, bread with you scrambled eggs for a breakfast or a dinner without having regrets. Body Attack Low Carb Bread makes you do not need to only imagine this. Bake, slice, eat! Apart from that, Body Attack Low Carb Bread contains a lot of protein, demand for which are not met by a traditional diet. It has been demonstrated that an insufficient consumption of this nutrient by physically active people results in a nitrogen imbalance of the body system, which increases catabolism and weakens post-workout regeneration. Moreover, large supply of protein during reducing diet results in satiety and increases thermogenesis after a meal, which facilitates weight loss. 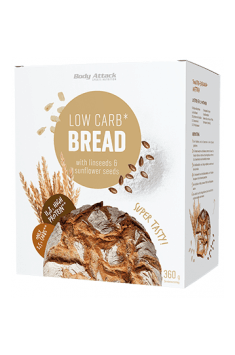 Body Attack Low Carb Bread diversifies a monotonous diet and allows you to eat varied and tasty dishes without serious restrictions. Thanks to that, people on a slimming diet are better motivated to keeping to their diet patterns. The bakery mix Body Attack Low Carb can be used in varied ways, i.e. with favorite herbs, seeds (cumin, sunflower, pumpkin, milk thistle or poppy), nuts (hazelnuts or walnuts) or vegetables (dried onion or carrot). This will provide additional nutrients and will results in a most suitable product form. A variety of components that can enrich the bread results in greater diversification of a diet. To sum it all up, Body Attack Low Carb Bread is a product for all people who do not want to give up on bread despite being on a reducing diet. The breads made with Body Attack Low Carb Bread improve life comfort during weight loss and diversify the dietary pattern. Use according to individual needs. Mix the package content with baker’s yeasts and 330 ml of warm water. Then pat a cake for about 2 minutes. Form a loaf or small rolls and put them onto a greased baking tray or into a form coated with baking paper. Cover the dough with a towel and leave for 45 minutes. Preheat the oven to 425°F and bake the bread for 45‒50 minutes. The bread can be also prepared without yeasts, you can use sparkling water instead of yeasts and warm water. Body Attack is a highly valued by athletes, German manufacturer of diet supplements and nutrients. The company, has got in their product range high-quality protein and amino acid supplements, BCAA supplements, beta-alanine and vitamin bars enriched with vitamins. Wheat gluten (54%), Almond flour, Linseed (9%), Sunflower seeds (9%), Table salt, Dried yeast, Spices, Separating agent (Silicon dioxide). The unique formula of carbohydrates. It provides greater strength and faster recovery. The sugars are the major digestible fuel in the body. We divide them into mono saccharides - glucose (dextrose), fructose (fruit sugar); di- (di-saccharides) - lactose, maltose, sucrose; complex sugars - starch. Most of them changes into glucose during the burning process. Sugars are sweet and increase the glycemic index (except fructose). The healthiest source of acquisition of simple sugars is a diet containing the so-called. products of the first milling and fresh fruit and vegetables in the raw form. Consumed during a strength workout, they delay fatigue, affecting the proper hydration of the body and keeping parts of glycogen. After finished workout,they accelerate the regeneration of the body and complement energy expenditure. The excess sugars result in the accumulation of excess fat and increase of fatty tissue. A responsible use of sugars is recommended for diabetics, both for hyperglycaemia (glucose level above the normal), and hypoglycaemia (blood sugar levels below normal). Excess consumption of simple sugars can cause tooth decay. Simple sugars are included in many dietary supplements, most commonly used in the carbohydrate and protein and carbohydrate supplements. Dosage: for competitive sport athletes it is recommended to consume simple sugars only during workout and immediately after workout.